Emily studied at the Pamela Darlington School of Dance, in Cornwall, England, part of the British Ballet Organization. Pamela Darlington, the highly respected dance teacher and senior examiner for the BBO, welcomed Emily into her school at the early age of 3, where Emily spent 15 years studying Ballet, Tap, Modern and Musical Theatre, successfully passing more than 20 BBO examinations. Also attending 7 of Pamela’s annual summer schools, Emily accredits all her knowledge and love of dance to Miss Pam, and is without doubt, her biggest fan! Apart from the shows regularly put on by the dance school, Emily began to participate in professional theatre at the age of 11, when she successfully auditioned for Cornwall’s first professional pantomime, in its brand new theatre. At 18 Emily moved to the beautiful Caribbean island, the Dominican Republic. Emily worked as a dancer in resorts all over the island, but finally settled into a position as dance captain at the Casa Marina Hotel here on the north coast. 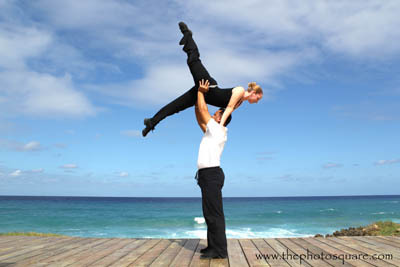 Emily left the hotel industry in June 2008, to realize her dream of opening her own dance school. The dream is now a reality. The Emily Watson School of Dance is open for business, offering classes in Ballet, Tap, Modern, Hip Hop, and Dancercise. Emily hopes that her school will offer all pupils the enjoyment, energy and enthusiasm that dance gives her. Carlos discovered his love for dance when he began to learn salsa in Puerto Plata. Realizing his potential, Carlos dedicated himself to practice and training for the professional salsa circuit. He became highly recognized and respected as a salsa dancer, and went on to win many competitions all over the country, even giving lessons in his spare time. Carlos later went on to pursue a career in the hotel industry, starting out as a dancer/entertainer, working his way up to become Activities Supervisor and later Activities Director. During his time in the hotel business Carlos has become proficient in many different dance styles from around the world, working with choreographers such as Gertrudis Grandales, Carlos Colon, Chiqui Adhad, Rafael Brito, Nelson Eddy and Ernesto De La Cruz.